Home > Ask The Get Out of Debt Experts > Debt Collector > Does Bilkish Associates Have Jurisdiction Over Me in the U.S. to Collect a Debt From Saudi Arabia? Thanks for your time Sir. 4 years ago, my wife had a job in KSA (Saudi Arabia). She got married then immigrated to USA to live with me. We are originally from Pakistan. Bilkish Associates started chasing her regarding her unpaid loan from alrajhi bank in saudi arabia of amount around 90000 riyals. At this point, we are in no condition to pay this loan back. Bilkish calling us here in USA threatening and also cursing. We both are US citizens. I told them repeatedly, they can’t do that especially they have no jurisdiction. They sent us this attached letter. These guys are based in Karachi, Pakistan and calling us from there. Do they have jurisdiction over here in US about unpaid loan in KSA? What should we do???? Because We’d like to sue them as they used very abusive language???? There are no federal legal cases Bilkish Associates has filed. Just because they are using abusive language it does not mean you have an obligation to pay. In fact, if they are being abusive you would actually have a claim to make under the Fair Debt Collection Practices Act. The issue is relatively easy to deal with, find a debt collection consumer attorney who is licensed in your state. One place to find such an attorney would be to . It should be affordable to have an attorney represent you in this matter and then if the collector calls, tell them you are being represented by an attorney and give them the attorney information. Then hang up. 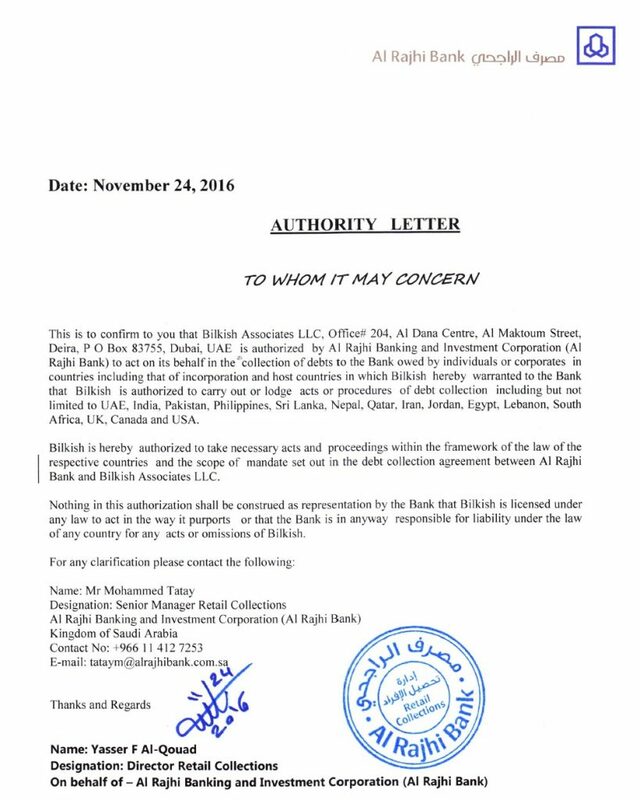 READ Will Bilkish Associates Go After Me for My UAE Debt? Will Bilkish Associates Go After Me for My UAE Debt? Asked question about Bilkish Associates.